We can not pretend to know the workings of the universe. Try as we might, our world contains so much complication and controlled disarray, if we attempt to sit down and process it all, we often feel our brains reduced to cinder. Rarely do we attempt to figure everything out when things are good. But when our life turns upside down? We always try to fight it or figure it out. Often, the best option is to roll with the punches, knowing the universe is leading you in the direction you should go. Eight months ago, Samantha and I opened our doors to one of her former students - Elise - who needed a place to stay in between her freshman and sophomore year in college. Elise had stayed with us the summer before when her family situation became complicated, and she knew we still had a room available. Like the guests on the SS Minnow, we thought her stay would be short, but as circumstances unfolded, that was not to be the case. We all have experienced times when the universe seems to dump on us. 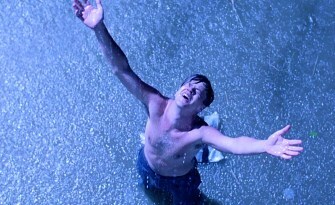 Movies often characterize this feeling in a scene with the main character standing in a deluge, shaking fists at the dark sky. This is how we feel. Abandoned. Betrayed. Like we are chained to the bottom of the world’s largest chamber pot, no escape in sight. About a month into Elise’s three month stay, her fist shaking moment arrived. Her boyfriend broke up with her through a text message. She totaled her car and was dropped from her insurance. She was fired from her job. And finally, financial aid she had been counting on was rejected, leaving her unable to pay for college the next year. All within ten days. The SS Minnow had shipwrecked, leaving a wallowing castaway stranded upon our couch to surf through the various young adult dramas found on Netflix. The way I see it, there are three ways people react to such a negative situation. 1. They will wallow in it, spreading their malaise to anyone they can. These are the Debbie Downers; their only impetus is to bring everyone to their level. Only then will their situation seem better. 2. They will analyze and attempt to understand it, hoping to wrap their brain around a problem so infinitely large, the only result is inevitable frustration. 3. They will accept the situation and allow the universe to guide them forwards. I suppose we go through all three of these on our way out of the pit, and it took Elise around three weeks to drag herself out of the muck and into the third step. I remember the moment clearly. I was sitting in my office and she popped her head in. She had met with an Army recruiter and would be enlisting as soon as she could. I smiled, sure this was a momentary attraction that would soon be gone from her flighty 19 year old head. Of course, the universe doesn’t just use situations like Elise’s to teach those to whom it happens. It is a teaching moment for everyone. Over the next few months, I couldn’t help but be tickled as the universe turned me on my head. Elise didn’t just climb out of her gloom, she burst forth, a phoenix rising from the ashes. Her dedication to the idea of the Army pulled her forward. Whether or not she realized it, she let go of many ideas that had exerted powerful control over her life in a negative way. She became more independent, crafting her life towards what she wanted it to be. She worked hard, finding a job she could enjoy until she left for basic. She bought a car on her own, found insurance, and came to terms with the boy who had abandoned her. Finally, she developed a fitness and eating routine like nothing she had ever done, losing over sixty pounds in three months to make weight for the Army. She ran towards her solution instead of away from the problem. She swears in and leaves for basic training tomorrow. The universe rejected everything Elise thought was important, but only to direct her to a better place. A place she was meant to go. So, no matter how hard your situation might seem, there is always a way out, a way up. Let the universe guide you; it will never dump you into the crucible of life without a purpose. Be accepting of what it delivers and soldier on. Eckhart Tolle writes about this too, how when you surrender to what is, you operate in harmony with the universe. When you fight it, you cause yourself and others pain. Exactly! Unfortunately, I have to admit that his book "The Power of Now" is sitting on my bedside table. I think it has been there for over a year now. I always have good intentions . . .